The internet is a grim place at the moment, even more than usual. It seems whenever I look at Twitter I have to choose between people bellyaching about Brexit, bellyaching about Trump, or ever more doom-laden predictions of the apocalypse. Yesterday I heard that Homo sapiens sapiens has a one in 500 chance of being extinct by the end of next year. And apparently Stephen Hawking has suggested that we probably only have 1000 years left on the planet. The atmosphere of terror that accompanies these predictions is because they break one of the last and greatest taboos of our time. No, not the menopause. I’m talking about death. Death is something that happens to other people. We know it’s coming but thanks to modern science and medicine we put it aside as something to deal with later on. As a result we’re not very good at talking about it and we tend to panic when someone suggests that it might be a possibility, even a distant possibility. One of the most striking differences between the present and almost every era of European history from the Middle Ages onwards is the apparent preoccupation of past cultures with the imminence of death, in particular the death of the young. It’s not them that’s different, though; it’s us. Memento mori images in paintings, monuments in churches that graphically depict the corpses of the dead, carpe diem literature; these are alien to us now. But before the last century they were everywhere. Think of Hans Holbein, whose handsome twenty-something Ambassadors are overshadowed by the enigmatic skull that predicts their demise. Medieval worshippers in church were often confronted by paintings of ‘The Three Living and the Three Dead’, juxtaposing three youths – or sometimes three kings – with three dancing, grinning skeletons, the image of what they will become. Many of the prayers they found in their Books of Hours were thought to act as talismans against a sudden death, and they petitioned saints whose exalted status usually derived, ultimately, from the manner of their deaths. The nineteenth century was perhaps the worst, fetishizing the young, virtuous and dying in literature and on the operatic stage. Think of Little Nell, Beth March, Mimi and Violetta. Mr Brocklehurst tells a ten-year-old Jane Eyre ‘Children younger than you die daily’ – and presents a dead child to her as an example of model behaviour. True, Brocklehurst is presented as a religious fanatic, but when Jane’s friend Helen dies at thirteen it becomes clear that Charlotte Bronte endorses his idealisation of death. Mourning clothes created an institution out of the shadow that death cast over a family; black-rimmed notepaper announced it to the wider world. Housman’s words, written in 1896, express a sentiment which would be unthinkable now. The catastrophizing talk of the past few weeks isn’t the anomaly. The anomaly is the illusion of immortality that the last fifty years has created. All that’s different now is that unlike in the past most people don’t have any hope of better things to come after death. Or do they? In a sense, what we believe about heaven and hell, paradise, the resurrection, doesn’t matter, because even our predecessors, saturated with religion, recognised that there are different paths to life after death than just the church way. In the 1470s Johannes Tinctoris, a music theorist, suggested that through their music, composers might secure ‘immortal fame’, because – as the poet Virgil had written – ‘short and irretrievable is the span of life for all; but to prolong fame by deeds – that is the task of virtue.’ Advice, perhaps, to be taken with that of Robert Merrick – life is short; enjoy it, but make sure you use it for good. Nothing I can think of says this better than my favourite Christian song: ‘We Are’ by the great Kari Jobe. There’s no need to be a Christian to appreciate this. It’s relevant to us all, now more than ever. Make the most of the time we have left. I learnt pretty quickly when I first started my PhD never to admit that my subject is music. Even ‘music history’ is a bit risky. There’s something about the word ‘music’ that gets people excited and makes them forget that actually you’re a PhD student, you’re a serious academic, thank you very much. We’ve all mastered the non-committal grunt in response to that inevitable question ‘Music, how lovely! What instrument do you play?’ and the rictus grin whenever someone says ‘Oh, you should meet my nephew. He plays the clarinet.’ I rarely describe myself as a music student now. I’m a historian, working on the English Reformation – oh, and I look at music as well. . Throwing a gift back at God. Maybe it was partly the wine talking but she was, of course, right. It’s all too easy to fall into the ivory tower mentality, trying to disown the very thing which other people – non-academic people – appreciate about our research, in the guise of maintaining ‘rigour’ or ‘seriousness’, and it’s not only damaging but rather despicable as well. We owe it to ourselves and society, in these days of ‘impact’, accountability, the REF, not to alienate ourselves from what really matters to most people about what we do: in other words, performance. Recreating historical performance styles and contexts has two huge benefits. One is obvious: it offers researchers who also perform, and who collaborate with performers, a source of information that they would otherwise lack. It’s a slightly less extreme form of experimental archaeology. So you want to find out how sixteenth-century performances worked? Try it and see. But one far more important benefit that performance offers to the music historian is that it opens doors to public engagement that would otherwise not exist. Those people (normally they’re friends of our grandmothers!) who always want to know what instrument we play, or whose nephews play the clarinet, haven’t just got the wrong end of the stick; they’re doing us a favour. Without realising it, they’re showing us how to engage them in our research: they might be interested in the history which we love, or the obscure composer we’ve just unearthed, but for them to feel comfortable enough to engage we have to start with a format that they already know – a performance. The best public engagement events I’ve been to have involved performance. One got the whole crowd singing from sixteenth-century manuscripts, even those who claimed they couldn’t sing. At another, a fantastic professional choir sang newly reconstructed music from a replica lectern, in a church, like real medieval choral singers did. Only a few weeks ago I and a group of Newcastle undergraduates borrowed that same lectern to perform music by Robert Johnson, newly edited and reconstructed: one very knowledgeable lady said she was ‘totally transported’ by the effect created in that combination of sight and sound. Live performance gets people talking and asking questions in a way that the ‘stand and deliver’ approach just can’t achieve. Musicologists are lucky. All the ingredients for great engagement and fantastic research impact are there for the taking. We just need to come down off our pedestals, listen to our instincts, and realise that – as always – grandma does know best. So begins the first canto of Dante Alighieri’s Divina Commedia. It’s perhaps one of the most famous opening lines in all Western literature – strange, perhaps, since it’s in medieval Italian. What’s also strange is that I’ve been immersed in Dante myself for the past couple of weeks, proof perhaps that research can take you in directions you never expected. The Virgin Mary’s labyrinthine family relations crop up occasionally in medieval hymns, using various different words for ‘daughter’ and ‘son’. One hymn for the Assumption, Sacra mundo fulget dies, has the line ‘Patris mater, nati nata‘: ‘Mother of the father, daughter of the son’. Stellam maris attendamus has the line ‘Tuae prolis filia’, ‘daughter of your offspring’. A common way of wording the concept is that Mary is both mother and daughter of the same being, as in the hymn ‘Te collaudat coelestis curia/ quae mater es et regis filia‘: ‘The court of heaven praises you , who are mother and daughter of the king’. A more famous example, which uses the ‘nata nati‘ motif, is Josquin des Prez ‘s motet Illibata Dei virgo nutrix. All this is interesting but it doesn’t explain the use of the words ‘filia‘ for ‘daughter’ and ‘filius‘ for ‘son’ in Ave Dei Patris. In fact, the word filius just isn’t used in this context in medieval hymns. Ave Dei Patris isn’t the most original of poems: pretty much every phrase is copied from somewhere else, so I knew that this line must have a direct precedent somewhere. The first line of this canto seems to be an almost exact precedent for the line in Ave Dei Patris. So how did a tiny fragment of a medieval Italian poem get to England and find its way into an English antiphon text? Well, I’m not certain, but there are a couple of possibilities. Firstly, it’s extremely unlikely that whoever composed Ave Dei Patris knew Dante’s work in Italian, as there were other translations available in England which, the evidence suggests, were in circulation before the original Italian version became widely available in the early 1520s. Fayrfax died in 1521, so it’s unlikely that he (or anyone else in his lifetime) knew the Comedy in Italian. Catherine of Aragon acquired a copy in Castilian some time after 1515, which was still in Henry VIII’s library at Whitehall in 1542 when an inventory was taken. She was also a fan of Petrarch, and owned two of his works in translation. Could Ave Dei Patris have been written for her – and deliberately included an allusion that she would recognise? It’s possible that it could have been written after 1515, but I suspect not, on those oft-quoted and ever-dodgy ‘stylistic grounds’. It could have been written for her marriage to Henry in 1509, but there’s unfortunately no evidence that Catherine – or indeed anyone at court – knew Dante’s work before 1515, so it’s hard to conclude that Ave Dei Patris was written for her. There is a more likely possibility, though. Some time around 1416, at the Council of Konstanz, an Italian bishop, Giovanni Bertoldi da Serravalle, wrote a Latin translation and commentary on the Divine Comedy under the guidance of two Englishmen, the Bishop of Salisbury and the Bishop of Bath and Wells. We know this translation circulated in England, because when John Leland carried out his survey of monastic libraries for Henry VIII, he found a copy in Wells Cathedral and another in Duke Humphrey’s Library in Oxford. And – crucially – the relevant tercet of Serravalle’s translation opens ‘Virgo mater, filia tui filii‘ – using the right words for both ‘daughter’ and ‘son’. The word order is slightly different in Ave Dei Patris, but that doesn’t really matter, because the poem’s lines are constructed in parallel: the genitive noun (or possessive), in this case tui filii, always comes first. This is by far the closest precedent I’ve been able to find for this line of the poem. Although there’s no evidence that Henry VIII owned Serravalle’s translation, only his Whitehall library was catalogued in 1542, leaving his library at Greenwich untouched. We still don’t know what was in that library – it could easily have included some Dante. It needn’t have done, however. One person who knew Serravalle’s translation very well was John Whethamstede, the abbot of the Benedictine St Alban’s Abbey from 1420 to 1465. Whethamstede had travelled extensively in Italy in the 1420s, first serving as a delegate at the Council of Pavia, but he also visited the Vatican. He was a prominent supporter of Duke Humphrey of Gloucester, the uncle of Henry VI, who donated his copy of Serravalle to Oxford in 1444. He also knew and cited Serravalle himself. Writing under the name of ‘Frumentarius’ or ‘Wheaty’, he produced many selections of extracts from Italian humanist works, including Serravalle’s commentary. He must, therefore, have had ready access to a copy of Serravalle’s work, presumably at St Alban’s. Fifty years later Robert Fayrfax, the first setter of Ave Dei Patris, would be working at St Alban’s Abbey and writing music for its choir. Coincidence? Perhaps not, if Fayrfax had access to books to both Serravalle’s translation and ‘Abbot Wheaty”s collection of extracts in the St Alban’s library. So what does this show? Well, it’s becoming more possible that Fayrfax wrote the Ave Dei Patris text himself. I’d suspected as much, because of the similarity between this poem and his Lauda vivi Alpha et O. He wouldn’t be the first court composer who was also a poet, and he wouldn’t be the first with an interest in Italian literature either: Gilbert Banaster, master of the choristers for the Chapel Royal in the mid-fifteenth century, was both poet and composer, who even produced a translation of part of Boccaccio’s Decameron. Knowing where the ideas of the poem come from is helping me to build a context for the composition of Ave Dei Patris and leads up to answering the big question: just why was it written? Alighieri, Dante. The Comedy of Dante Alighieri the Florentine: Cantica III, Paradise trans. Dorothy L. Sayers and Barbara Reynolds. 2nd edition. (Harmondsworth: Penguin Classics, 1964). Botterill, Steven. Dante and the Mystical Tradition: Bernard of Clairvaux in the Commedia (Cambridge: Cambridge University Press, 1994). Havely, Nick. Dante’s British Public: Readers and Texts, from the Fourteenth Century to the Present (Oxford: Oxford University Press, 2014). Hayward, Maria. The 1542 Inventory of Whitehall: The Palace and its Keeper 2 vols. (London: Illuminata Publishers for the Society of Antiquaries of London, 2004). Starkey, David (ed.) Henry VIII: A European Court in England (London: Collins & Brown in association with the National Maritime Museum, Greenwich, 1991). Weiss, R. Humanism in England during the Fifteenth Century 3rd edition (Oxford: Basil Blackwell & Mott, 1967). I was very excited to hear that the Duke and Duchess of Cambridge have had a new baby girl – Princess Charlotte Elizabeth Diana. It’s amazing to think that such a tiny little person has the opportunity to make her mark on history in such a big way! The birth of Princess Charlotte got me thinking, and I realised just how many Tudor and Stuart monarchs were second children, who weren’t ever expected to rule until an accident of fate thrust them into their older sibling’s place. In days when as many as half of all children didn’t make it to adulthood, the expression ‘heir and spare’ wasn’t just a rather unpleasant figure of speech, it was a political reality – all too often the ‘spare’ would be called upon to assume the heir’s position. Of ten monarchs who reigned between 1500 and 1700, eight were not the intended heir: only James I and Charles II were the eldest sons of sovereigns. Even James I was the son of a Scottish queen, not an English one. In many cases, the child who might have been expected to rule – to take up pride of place in the history books – now occupies only the merest corner of the page, but they nevertheless make their mark in other ways. It’s one of these ‘lost heirs’ that I’m writing about today. Of the seven children born to Henry VII and his wife Elizabeth of York, four survived the dangerous early years: Arthur, Margaret, Henry and Mary. Arthur was the prized heir and Prince of Wales. The girls made prestigious political marriages to the kings of Scotland and France. Henry was expected to marry a foreign princess or heiress to a duchy, make his name at the tiltyard or on the battlefield, and support his brother as companion and political ally. Around 1500, when Arthur was fourteen years old, the composer Edmund Turges wrote a carol in three parts, ‘From stormy windes’. It’s a prayer for Prince Arthur’s safety, and it refers to him as ‘the ostrich feather’, which is the emblem of the Prince of Wales to this day. Listen to it here. From stormy windes and grievious weather, Good Lord, preserve the Estridge Feather! 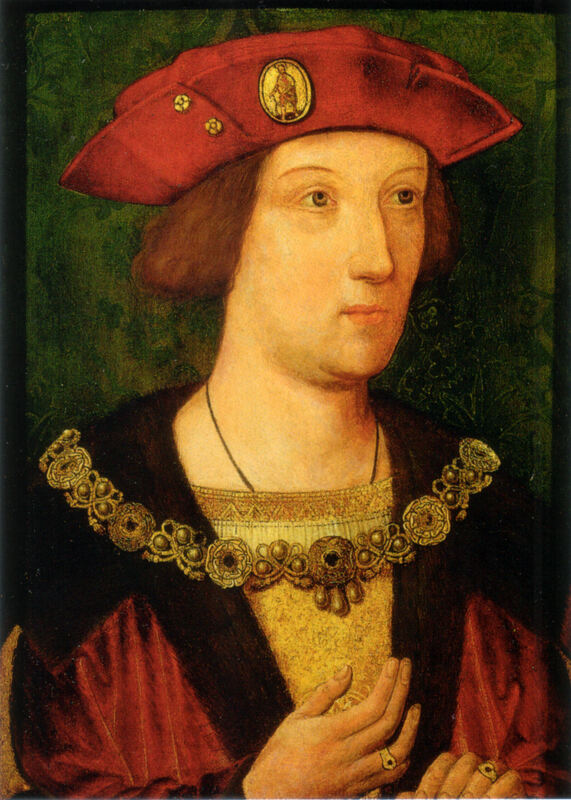 Prince Arthur was the ideal royal heir: tall, handsome and clever, and in 1501 he made a prestigious marriage. His bride was Catherine of Aragon, the daughter of Ferdinand and Isabella of Aragon, Infanta of Spain, and their marriage would help secure the new Tudor dynasty’s place among the European powers. He would rule under the title of King Arthur, the legendary Celtic King who was said to have united all of Britain under peaceful, prosperous rule, an idea which carried great symbolic power in an age when Scotland was still an independent country. But it was not to be. Arthur died in 1502 when he was just fifteen, a few short months after his wedding. We still don’t know exactly what killed him. Arthur was buried at Worcester Cathedral. His chantry chapel, where priests would sing Masses for the safety of his soul, still survives as a lasting reminder of his short life. As well as this monument in stone, we also have a musical monument to Arthur, written by the composer John Browne. Browne is a bit of a shadowy figure, partly because there are so many people with this name in the surviving records that it’s almost impossible to identify which one was him. But he survives as one of the best-represented – and perhaps one of the best – composers in the Eton Choirbook, and one of the pieces contained in Eton is this one, Stabat iuxta Christi crucem. The text is loosely based on the much older medieval sequence Stabat mater dolorosa, which is most famous now in a setting by the eighteenth-century Italian composer Pergolesi. It describes the grief experienced by the Virgin Mary as she watched her son Jesus die on the cross. Devotion to the sorrow of the Virgin was common in this period, and images of Mary grieving over Christ’s dead body often appear with indulgenced prayers in contemporary Books of Hours. There was even an Office of the Sorrows of the Virgin, which provided prayers for all seven Office hours of the day. But Browne’s piece is unique, because whenever all six voices of the texture are heard at once, the tenor voice invariably sings a familiar tune: From stormy windes. What does this tell us? Well, it helps that we can date the piece to around the time of Arthur’s death, which in turn has been used as evidence to date the Eton Choirbook itself and to trace Browne’s career. But it also tells us something about the culture of the early Tudor court. By personalising his piece with a tune associated with Prince Arthur, Browne implies that the petition at the end of the piece, ‘Ask and beg your Son that he may without delay grant joy to us your servants’, might be a plea to speed Arthur through purgatory. It could even have been sung in his chantry chapel. More tantalisingly, it also offers important evidence of a web of symbolism that may have surrounded the royal family. Browne’s use of the song for Prince Arthur symbolically unites him with Christ, and his grieving mother Elizabeth of York with the Virgin Mary. There’s a huge amount of potential to link English queens symbolically with the Virgin. According to medieval Christian belief, Mary was crowned Queen of Heaven, she was the mother of Christ the King, and she was also his bride as well. Like a queen on earth, then, she was married to a king and gave birth to a king as well. Queens also had an important role as intercessors in this period: when the king was dispensing justice, the queen could intercede with him on behalf of the defendant. This was exactly the role that Mary was said to have in heaven: if a sinner prayed to Mary for protection, she would beg Christ for mercy on their behalf. Stabat iuxta Christi crucem shows that, in Elizabeth of York’s case, this potential for symbolism became a reality, and it opens up the possibility that allegorical references to real women might have been intended in other Marian pieces as well. I’ve already suggested that Ave Dei Patris filia might have been first intended for Elizabeth or maybe for Catherine of Aragon. Knowing that the symbolism existed in one piece means that it’s not unthinkable for it to have existed elsewhere too. But more touchingly, Stabat iuxta Christi crucem and From stormy windes open a window onto one of England’s lost princes, the honour in which he was held during his short life and the enormous sadness that followed his death. It was said that when Christ died on the cross, a sword pierced the Virgin Mary’s breast with grief; Browne’s piece recognises that Elizabeth of York must have felt exactly the same abject sorrow at the loss of her son. It’s a rare glimpse of the Tudor royal family’s emotion and human feeling. Arthur never got to make his name as King of England. We can only see and hear the monuments to his life that are left behind and wonder: what might have been different had he lived to grow old? Benham, Hugh. ‘Prince Arthur (1486-1502), a Carol and a cantus firmus’ Early Music 15 (1987), 463-468. Duffy, Eamon. The Stripping of the Altars: Traditional Religion in England 1400-1580. 2nd edition (New Haven: Yale University Press, 2005), 256-265; pl. 96. Hocking, Catherine. ‘Cantus Firmus Procedures in the Eton Choirbook’ (PhD dissertation: University of Cambridge, 1995). Pelikan, Jaroslav. Mary Through the Centuries (New Haven and London: Yale University Press, 1996). Williamson, Magnus. ‘The Eton Choirbook: Its Institutional and Historical Background’ (DPhil dissertation: University of Oxford, 1997). Since my last posts over a month ago I’m afraid I’ve rather neglected my blogging duties! I have very little excuse I’m afraid, except that I was doing rather a lot of writing up (literature reviews – oh rapture unrestrained…) and didn’t feel I had anything interesting to say… Well, I’m back now, it’s pouring with rain, and I have something to share which I, at least, am really excited about, because it shows a side to Thomas Tallis that we’re not at all used to seeing, and how a piece disowned by its composer could acquire a new status years and years later. I’m re-editing Tallis’s Ave Dei Patris filia setting and I’ve finished the first stage – transcribing all the surviving sources and piecing them together in the right order. Unlike the other settings of this poem, Tallis’s only survives in late Elizabethan and Jacobean sources, which are all connected to three men: John Sadler, Edward Paston, and Sir John Petre. Another antiphon by Tallis, Ave rosa sine spinis, appears in exactly the same sources, but it can also be found in the Peterhouse partbooks which date from about 1540. Logically, then, you might think that Ave Dei was composed after 1540, but as soon as you listen to it, it’s clear that this can’t be right. That’s because Ave Dei just isn’t very good, at least not by the standards of Tallis’s work that we’re used to. There are several moments of parallel fifths, either obvious ones or very thinly veiled, as if he knew he shouldn’t do it but couldn’t think of an alternative. You also often feel that the treatment of dissonance is slightly uncomfortable, as if he were thinking ‘Now, I know I ought to put a suspension in here, but I’m not quite sure how – this’ll do…’. It’s not all bad, of course. Some of the melodic lines are a bit circular and repetitive, but given the expansive style I’m not sure we can use this as evidence of incompetence. And there are some moments of truly delicious harmony, and some imitative passages that would have made Taverner proud. It’s usual, however, to date Ave Dei to the very earliest stages of Tallis’s career, perhaps as the earliest piece he ever wrote that still survives, and having got to know it pretty well in the past few weeks I agree with this assessment. When he wrote this piece, he was finding his feet as a composer. It probably dates from the early 1520s at the latest and may even be from the late 1510s – he might have been as young as 15 or 16 at the time, perhaps having turned to composition as his voice changed and he needed a few more strings to his bow in order to continue his musical career. Perhaps the reason that it only survives in later copies – all of which date from after Tallis’s death – is that at the time it was composed it wasn’t considered good enough to share beyond Tallis’s immediate circle. How it eventually escaped that circle is unclear, but there is one possibility which I’ll explore in a bit. The question for me is how these three men – Sadler, Petre and Paston – got hold of copies of Ave Dei so that they could produce their own, when apparently it didn’t circulate in Tallis’s lifetime. Actually it could have been pretty simple. Although we don’t know where Tallis was when he composed Ave Dei, we do know that he was at Waltham Abbey, in Essex, when it was dissolved in 1540. Tallis lost his job and transferred to Canterbury Cathedral, and all the lands and assets from Waltham were given by the crown to Sir William Petre, whose son later became Sir John Petre. At the same time as the Petre family received the land from Waltham Abbey, they also mysteriously acquired a new organ, which David Price has suggested may have been that used by Tallis at the Abbey. (Patrons and Musicians of the English Renaissance, p. 62.) If this is true, then it’s more than possible that Sir William might have acquired the music books from Waltham Abbey at the same time as the organ. 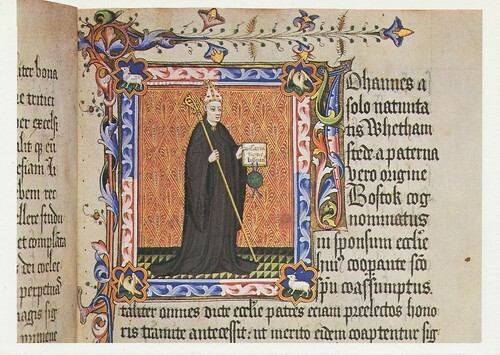 Tallis might have left behind the Abbey copy of Ave Dei rather than taking it to his new job in Canterbury – he was capable of better things now – which would explain the presence of Ave Dei in the Petre collection, and how it found its way into the library of Sir John Petre’s friend Sir Edward Paston. Since they shared a music scribe, it’s not surprising that the collections of these two Catholic recusants should share the same repertoire. And what about John Sadler? He worked at Oundle and Fotheringhay, neither of which are close to Norwich and Chelmsford where Paston and Petre lived. But according to the stemmata created by Penelope Rapson of other pieces by Tallis, and by me of Fayrfax’s Ave Dei and Lauda vivi, his copies are very closely related not only to Paston’s and Petre’s but also to the Norwich source Tenbury 1464. It’s not clear at the moment what Sadler’s East Anglian connections were, but they certainly existed. So – with the inevitable caveats – the story of Tallis’s Ave Dei is one of a young composer setting out, who decided to write a piece based on one by the most senior and respected composer of his time, and who later rejected it; of a family who acquired some music books by chance, and who later rediscovered the piece as its composer gained new status; of a scribe who moved from family to family and took his music with him. It’s everything I find fascinating about how music in Tudor England could travel around, gaining and losing status and new associations as it went. Mateer, David G. ‘John Sadler and Oxford, Bodleian Mss Mus E. 1-5’ Music and Letters 60 (1979), 281-295. Price, David W. Patrons and Musicians of the English Renaissance (Cambridge: CUP, 1981). Rapson, Penelope. ‘A technique for identifying textual errors and its application to the sources of music by Thomas Tallis’ (DPhil thesis: University of Oxford, 1982). One of the pieces we looked at was John Redford’s Sint lumbi vestri. Redford was an organist who worked at St Paul’s Cathedral and who died in 1547 (He also seems to have worked at St Cross, Winchester, which I visited, aged twelve, in preparation for my confirmation – another blast-from-the-past). Sint lumbi vestri is in six parts, and the missing tenor has a line of plainchant around which the other parts weave an elaborate web of counterpoint. Because the tenor has plainchant in long notes all the way through, and we know how the plainchant should go, you’d have thought it would be easy to reconstruct – but appearances can be deceptive! A bit of background before I explain. In England during the reign of Henry VIII, most churches used the plainchant melodies and liturgical texts dictated by the Use of Sarum (another name for Salisbury). A few others used different Uses – there was a Use of York, and a Use of Hereford, for example, and monasteries often had their own Uses which could vary a lot from the others. There had at one time been a Use of St Paul’s, and it had been believed (as John Milsom told us on Sunday) that it had died out in favour of the Use of Sarum long before Redford’s time, leaving no surviving record of its repertoire of plainchant. But when you try to fit the Use of Sarum plainchant for the Sint lumbi vestri text into the gaps in Redford’s composition, you come across problems pretty quickly – and John Milsom thinks that this is evidence that Redford was in fact using the Use of St Paul’s melody that we thought had long been abandoned. Using a mixture of the Sarum, York and Hereford plainchant melodies, we reconstructed the lost tenor as far as we could, and then filled in the gaps with the best possible notes for the job. We were left with a tenor melody that had elements of all three surviving Uses, but some unique features, and it’s just possible that we’ve managed to reconstruct the only surviving melody from the ancient Use of St Paul’s. It’s a proper piece of musical archaeology. Now, why couldn’t first-year Techniques have been as exciting as this? I can’t wait now for the second Recon workshop, which is provisionally booked for 13th November 2015 at Sidney Sussex College, Cambridge. For more information, have a look at http://www.tudorpartbooks.ac.uk/newsevents/.